Shackleton, Crean & Worsley - Salvation at Stromness, South Georgia. ← Tom Crean – A Poem by Ronnie J. Smith. And this was the moment! It was the moment the escape from the ice was over, and the rescue could begin. How glorious did the blubber drenched, whale stenched, galvanised garrison of Stromness, appear to the three men, that day? They had become the first humans to traverse the uncharted interior of the island. 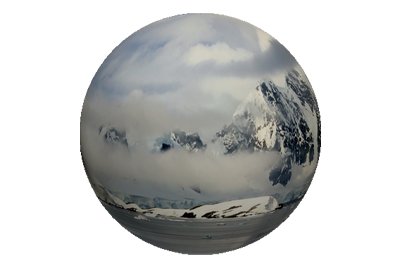 It had taken them 36 hours, over peaks, crevasses and glaciers. That pioneering stage of the journey, was a necessity of having landed on the wrong side of the island. That in itself was a prerequisite of a violent hurricane that enveloped them as they approached the island, after a wretched 17 day, 800 mile voyage, in a lifeboat. Only a few miles away, that night, a 537 ton ship, named Argos sank with the loss of all crew. Their voyage from Elephant Island, had represented their only hope of rescue. All 28 crewmen of the Endurance, had sailed to the rocky outcrop in three lifeboats salvaged from the ship, before it was pulverised by the ice that had entrapped it for months. But being uninhabited, and nowhere near any shipping lanes, Shackleton immediately knew, upon landing there on April 16th, that it was merely a temporary haven, which could offer no conclusive solution to their plight. It was of course a moment of utter jubilation for all, to stand on land again, for the first time in 497 days. More importantly the 28 men had spent the previous seven days crammed into the three tiny boats, aboard which the conditions were appalling. So despite it’s bleak and foreboding countenance; arrival at Elephant Island lifted the spirits of all, and manifested hope, that perhaps there was a possibility of escape. They were forced to launch the boats, on April 9th, as the ice floes they had spent months living upon, began to break up beneath them. They did not know where they were heading, other than to sea. The strong currents of the Southern Ocean, the deteriorating condition of the men, and the eventual realisation of it’s attainability, were the persuasive factors in ultimately aiming for Elephant Island. Once there, the next phase of the escape, had to be plotted. That was to relocate from where they had landed, as evidence of high tides, rendered the site too dangerous for the establishment of a permanent camp. Shackleton decided that Frank Wild should explore the coastline of the island in the Stancomb Wills, and endeavour to find a more suitable spot, where a long term camp could be established. Wild took with him Tom Crean, Marston, Vincent and McCarthy as they were noted as the strongest and fittest of the bedraggled party, and headed westwards in the tiny lifeboat. When Wild and his crew arrived back in the Wills, they reported that they had found a 200 yard long, sandy stretch, that could serve the purpose of establishing camp, and it was seven miles west of their current position. Soon all 28 men were back aboard the lifeboats, for what proved to be yet another treacherous journey. Yet ultimately successful. As the men busied themselves establishing their new shelter, Shackleton again had to consider the next juncture of the journey. Few, if any, would have determined that an 800 mile voyage, across one of the most violent stretches of water on the planet, in a lifeboat, during the onset of the Antarctic winter, was a feasible solution. In fact it never was. It was ludicrous. Suicidal. 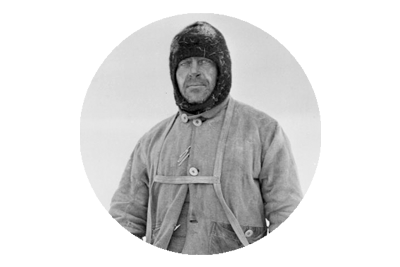 Yet when Shackleton announced the intention, and looked for five volunteers to accompany him, each and every one of the men put their name forward. 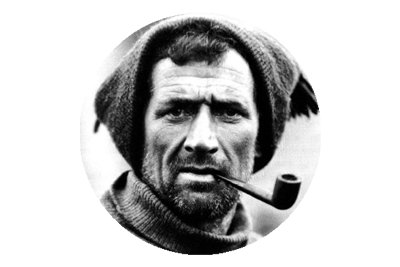 Tom Crean was aghast when Shackleton asked him to remain behind, and help Frank Wild to take charge of the group that would stay on the island. As each day of preparations for the voyage passed, Crean badgered Shackleton for a berth on the boat. He was not a man to remain behind in idle limbo, when there was a challenge ahead. Shackleton yielded to the pleas of the Irishman, and finally announced that those that would accompany him would be: Frank Worsley, Tom Crean, Timothy McCarthy, John Vincent and Harry McNish. Six men whose names should roll from the tongues of history, as easily as any; for they would embark upon the most epic of open boat voyages. The absolute enormity of what these men achieved and endured has never been accurately appreciated or rightfully recognised. Perhaps because it is almost impossible to comprehend. We tend to consign the feat to another age, when ‘people were tougher‘ or ‘made of sterner stuff. Yes, the remarkable events transpired over a century ago, but this only compounds the complexity and significance of the feat. For when measured against modern standards, these men were inadequately clothed, underfed and ill-equipped. Yet they triumphed gloriously. At 7 a.m. on the morning of May 20th 1916, as they grappled through the perilous interior of South Georgia, they heard it! It was the whistle that summoned the working day, at the whaling station, and they knew they were close. The haunting notion that the station may not have been manned when they arrived there, disappeared with the last strain of the signal. 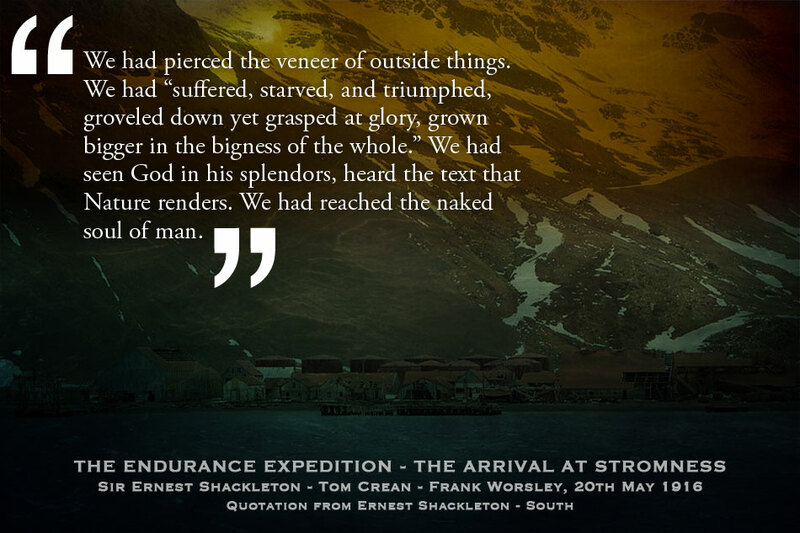 Sir Ernest Shackleton – South – On hearing the steam whistle, emanating from Stromness Whaling Station. Soon they could see Stromness, and it was buzzing with the specific activity of remote whaling stations. They were still quite a distance away, as they viewed the busy scene from their lofty vantage point. Negotiating a safe descent was every bit as treacherous as any other part of that journey. They climbed and slid down slopes, walked straight into a snow covered lake, before reaching the top of a waterfall, which would prove to be their final hurdle. The one piece of ‘equipment’ they had with them was a length of rope. This they lashed to a rock, and one by one, they descended through the frigid cascade. Tom Crean went first, as it was decided he was the heaviest of the three. Though drenched and freezing, they were elated! It was now a short, and comparatively straightforward walk into Stromness. What a glorious moment that must have been! Their arduous journeying was over, and for that final stage of the journey, they sauntered to salvation. Sir Ernest Shackleton – South. Even the manager at Stromness, Mr. Sorlle, who knew the men, failed to recognise Shackleton, Crean and Worsley, such was the extent of their destitution. But once identities had been established, Sorlle and the Norwegian whalers, could not do enough to help the men. Hot baths, fresh clothes, haircuts and a lavish meal were quickly bestowed upon the trio. When they recounted the details of their passage there, many of the hardened, well seasoned sailors wept openly. For they knew the ice, the Weddell Sea, the subsequent perils, and the enormity of what the men had suffered and achieved. Rescue was immediately arranged to pluck McCarthy, Vincent and McNish, from the other side of the island. Being the navigator, Frank Worsley accompanied the whalers, to pinpoint the exact location. That night Shackleton and Crean slept at the managers house, in beds, in warmth and comfort, in a room with electric lights. 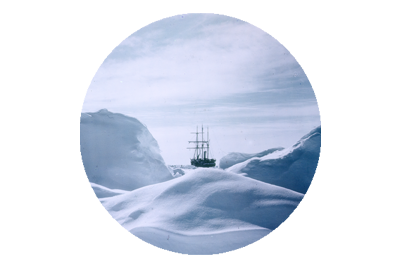 “We were so comfortable that we were unable to sleep,” Shackleton later wrote. They had much to deliberate upon. The 22 men on Elephant Island were now their ultimate concern. It would take many months, many failed efforts, but eventually Shackleton, Crean and Worsley made it back to Point Wild, aboard the Yelcho. Despite their trepidations, they arrived on August 30th, 1916, to find all of the crew alive. Stromness – a mere whaling station on a remote and desolately beautiful island, populated only by those who toiled there seasonally, will forever be synonymous with the epic tale of the Endurance Expedition. It was at Stromness that the great escape was completed. From there the seeds of the protracted rescue were sown. Though hundreds of miles from civilisation, Shackleton and his men would never forget the humanity and compassion they received, from the tiny community that endeavoured there. Long since abandoned, and now lying in ruins, Stromness will always hold a deep fascination for those captivated by the story of the Imperial Trans-Antarctic Expedition. The spirits of that epic odyssey will forever enchant the place. Shackleton – Stromness. A Quote.